Looking for a simple and economical way to attract or inform customers in high traffic areas? 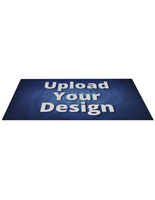 Floor graphics are much more than just simple stickers! These versatile promotional accessories come custom-printed in full color, making them ideal for promoting brand identity as well as advertising new service or product lines in POP or POS retail environments. 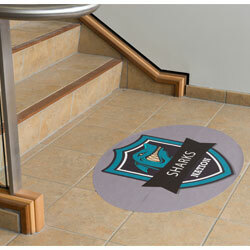 Floor graphics, also known as flooring decals, are a cost-effective alternative to wayfinding signage. 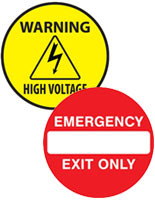 Many conference and convention facilities, as well as schools, universities and other institutions, choose this type of stick on accessory for personalized decor to help build audience engagement. 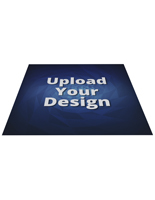 These slip resistant floor graphics can be used for up to three months in either an indoor and outdoor setting, making them one of the most versatile signage choices on the market. 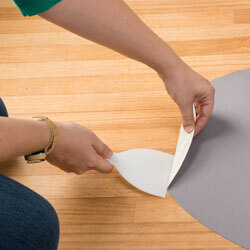 What shapes do stick on flooring decals come in? 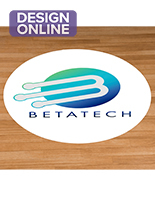 Round floor graphics can be matched to circular logos and messaging for a custom look that stands out. 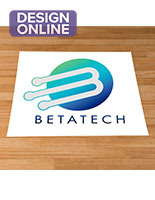 Square logo carpet stickers are easily matched to text-based or graphical wayfinding signage messaging. Oval flooring graphics have a softer-edges shape that attracts attention and complements a variety of logo or image designs. Rectangular decals are easily integrated into commercial environments but command attention on almost any surface or substrate, including concrete. 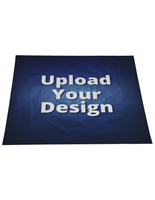 Customized flooring graphics are a simple, fast way for businesses in any industry to build brand awareness at promotional events. Augmenting trade show booths with signage on carpet or interlocking foam mats means that messaging can be added to match existing booth accessories. 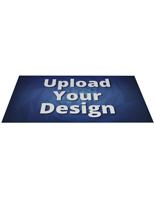 Unlike customized designs for standard carpeting, printed floor decals are inexpensive and lend themselves well to rebranding or new merchandising campaigns. This makes it a perfect choice for commercial businesses as well as retail stores. In addition, many offices, service businesses, industrial and manufacturing environments utilize high visibility, slip-resistant flooring graphics as wayfinding or labeling signage. 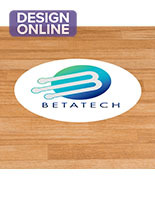 What substrates and surfaces will reusable flooring graphics decals stick to? The durable construction of our innovative carpet advertising decals means that they can be used at both indoor and outdoor locations. The textured surface provides a slip resistant surface for customers and visitors. 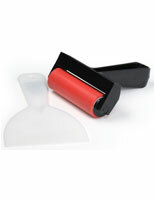 Full backing coverage with adhesive ensures a firm grip. The textured flooring surface ensures that graphics remain visibile and undamaged for the longest possible time, as the texture will wear away before the messaging. Shared facilities — convention centers, meeting rooms, conference halls, auditoriums, schools and universities — frequently host events, meetings, seminars and classes. Wayfinding or messaging signage not only helps participants and visitors, but also offers increased opportunities for both advertising and engagement. Commercial and retail businesses find this type of reusable flooring accessory indispensable for seasonal advertisements as well as everyday brand building. When used in conjunction with window clings, posters, and flags, stores and service providers find it easy to create high visibility holiday marketing campaigns for increased sales.